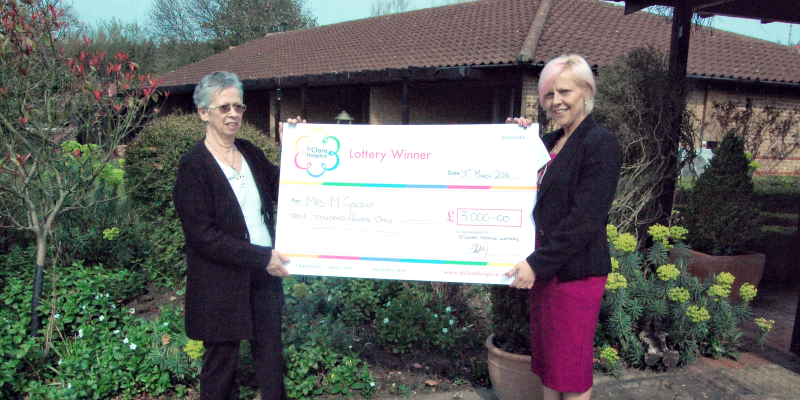 A cheque for £3,000 was presented to the winner of St Clare Hospice’s 26th annual Spring Raffle. The giant cheque was presented to Margaret Goldup whose ticket was drawn by our Finance Director, Riyad Islam, at the hospice on March 31. Mrs Goldup is planning to spend the lucky windfall on treating her grandchildren and putting the rest of the money into savings for a rainy day. Over 26 thousand tickets were sold for the Spring Raffle, contributing more than £27,000 to St Clare – helping to fund the compassionate care and support it provides free of charge to local people with life-limiting illnesses and their loved ones. If you missed out on winning the St Clare Spring Raffle this year, why not sign up for a chance to win the weekly St Clare lottery? For just £1 entry you could be in with a chance of winning one of 24 cash prizes, including a rollover of up to £10,000. To sign-up for the St Clare Lottery online click here. For more information about playing the Lottery, email the St Clare Lottery Team at lottery@stclarehospice.org.uk or call 01279 773730. Spring Raffle Tickets now on Sale!